Co-Optimus - News - A Taylor Swift Three Pack Is In Band Hero, But What About Importing? We've just recieved word of the latest songs revealed for tween friendly music game Band Hero. 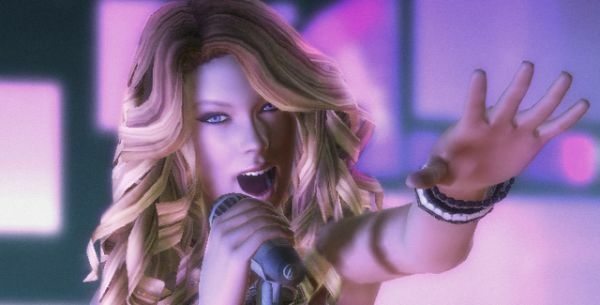 The big focus of Band Hero seems to be young Taylor Swift, featuring her in three different songs as well as an in-game avatar. If you were looking to "rock out" to You Belong With Me, Picture to Burn, and Love Story, you'll get the chance on November 3. Considering there are several decent tunes in the Band Hero song list, we wondered if we'd be able to import them into Guitar Hero 5. We asked Activision about it several days ago, and thus far, we've not received a response. Sometimes, no news is good news, but in this case, we're guessing you won't be able to export these songs to Guitar Hero 5. Too bad, because, hey, MR. ROBOTO IS AWESOME. * The Airborne Toxic Event - "Gasoline"
* Big Country - "In a Big Country"
* The Bravery - "Believe"
* Cold War Kids - "Hang Me Up To Dry"
* Counting Crows - "Angels of the Silences"
* Dashboard Confessional - "Hands Down"
* David Bowie - "Let's Dance"
* Devo - "Whip It"
* Evanescence - "Bring Me To Life"
* Fall Out Boy - "Sugar, We're Goin' Down"
* The Go-Go's - "Our Lips Are Sealed"
* Hilary Duff - "So Yesterday"
* Jesse McCartney - "Beautiful Soul"
* The Kooks - "Naïve" * Marvin Gaye - "I Heard It Through The Grapevine"
* Mighty Mighty Bosstones - "Impression That I Get"
* OK Go - "A Million Ways"
* Pat Benatar - "Love Is A Battlefield"
* Robbie Williams and Kylie Minogue - "Kids"
* Styx - "Mr. Roboto"
* Yellowcard - "Ocean Avenue"
* The All-American Rejects - "Dirty Little Secret"
* Aly and AJ - "Like Whoa"
* Carl Douglas - "Kung Fu Fighting"
* Don McLean - "American Pie"
* Duran Duran - "Rio" * Jackson 5 - "ABC"
* Janet Jackson - "Black Cat"
* Katrina and The Waves - "Walking On Sunshine"
* Lily Allen - "Take What You Take"
* Maroon 5 - "She Will Be Loved"
* No Doubt - "Just A Girl"
* Roy Orbison - "Oh Pretty Woman"
* Snow Patrol - "Take Back the City"
* Taylor Swift - "Love Story"
* Taylor Swift - "Picture to Burn"
* Taylor Swift - "You Belong With Me"
* Tonic - "If You Could Only See"
* Village People - "YMCA"